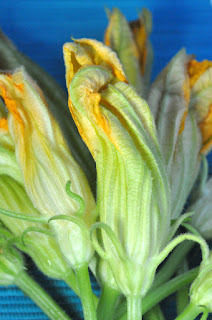 Here's another farmer's market goodie I couldn't resist - zucchini blossoms. I usually either pick up some at the farmer's market or pick them from my garden and fix them this way. I love the combinations of textures, the crunchy flowers and the soft cheese filling. Buy the female flowers with baby zucchini attached, or the male flowers with a long stem. The zucchini blossom will cook up just the same. I don't usually serve fried food, but these are the exception. They're cooked in the smallest amount of oil possible to still yield crunch. Canola oil has a higher smoke point than the olive oil I usually cook with. That means the flowers can be cooked at a higher heat - meaning there's more crunch for the bite, and less oil absorbed. Besides being tasty, how often can you say, "we're eating flowers for dinner tonight"? 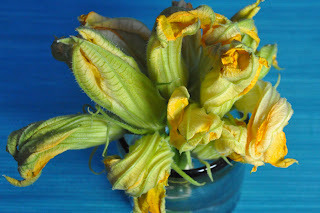 Clean the zucchini blossoms. If you have female flowers, remove the baby zucchini and the inner flower parts. If you have male flowers, remove the inner flower parts. Mix the cheese together with the basil and garlic. Stuff each flower with about 1/2 to 1 tsp of the cheese mixture, depending on the size of the flower. Set the stuffed flowers aside while you break the egg into a bowl and slightly beat it. Mix the flour together with the Parmesan, salt and pepper on a plate. Heat the canola oil over medium high in a large nonstick skillet. Dip each filled zucchini blossom first into the egg, then roll in the flour mixture, and finally place in the skillet. Cook the zucchini blossoms about 2 minutes per side, until brown and crunchy. Remove from the skillet and drain any residual oil onto paper towels before serving. Stealthy Cooking Tip: These can also be cooked with the baby zucchini attached. Then, you're getting a young, tender zucchini bite with each crunchy, cheese filled flower.